Originally there was little choice...OEM or KYB Excel-G, period (and OEM is made by KYB). Then the revamped OEM suspension came out ('13/'14), which was reportedly stiffer. And now I see that there are a couple more aftermarket options available (Cusco and Bilstein), but both are listed only for the later cars. I am under the impression that the later OEM dampers are a direct swap into the earlier cars. If so, then the aftermarket stuff should be as well, yes? Primitive does list the Cuscos as an option for '10-'14 (and a Cusco doc I found indicates the same part numbers), so I guess that's confirmation? I've been running Rallitek lift/load springs for a little while now (+1"F / +1.5"R) and while I am very happy with the lift results and performance when loaded, they are just too much spring for the current dampers when unloaded. Compression is fine, but the car really kicks in rebound. I should mention that the springs went in as part of completely new strut assemblies...these are not new springs on tired dampers. I used OEM group N tophats and the Excel-Gs. I need more rebound damping, in the rear especially. 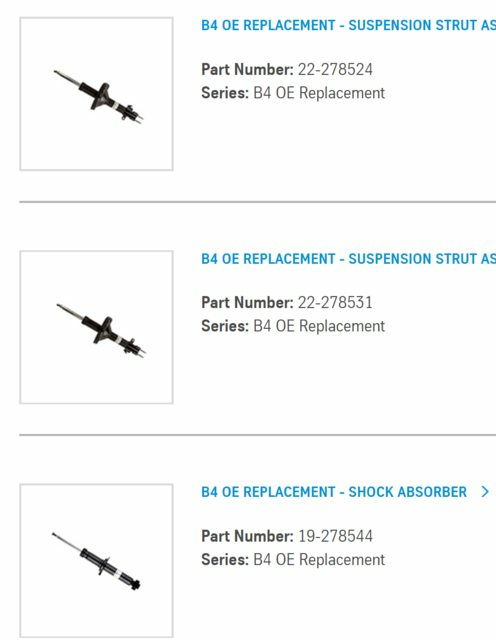 Can anyone speak to the performance of the Bilstein (B6) or Cusco (Touring A)? Cusco is adjustable (unclear in what way) and claims "140% stiffer" at max setting. Bilstein does not give specifics. I am also interesting in knowing the actual difference between the years. I've heard it mentioned here a bunch of times but no one has given specifics. Rock Auto lists two different Monroe dampers 10-12: MONROE 72691. 13-14:73039. Not sure how those compare to the KYB:10-12 KYB 340027 13-14: KYB 3410030. I am interested in some answers as well. I pulled this data from rock auto's pages. The two are close, but not exactly the same. The differences are more than just internal valving (most interesting is the additional 1.5in travel). But is it close enough to use the updated part in the older 4thgen? And can the 10-12 springs be used in the 13-14 strut? I emailed KYB and will try and call Monroe again tomorrow. Doubtful they will have answers, but we'll see. Also inquired with Rallitek. Fitment of both struts is more or less the same, the primary difference is that 3410030 is about 0.2” longer in extended length. 3410030 also has about 15% higher damping that 340027 that we list for the 2010 Outback. We haven’t tested the strut for the newer models on the older vehicle, but you likely could use it on your vehicle. I am getting some Rallitek RTEK-830-521-355 rear springs and will be buying the 3410030 (13-14) dampers. I've been watching the Bilstein offerings after looking for alternatives to the KYB's and finally got my hands on a set a few days ago. I went with the stiffer HD's - I've had good experiences with them on other cars. These are the B6s? On what year car? Yep, B6's. They are going to go on a 2015. According to Bilstein they have a fitment for the Gen4 outbacks too. They list the B4 part numbers as 2010-2014 and the B6 part numbers as 2013-2014. I would be surprised if you had trouble interchanging them, they might just be too much damper for the soft springs in the early years.